A lot of people buy bicycles never intending to ride after dark and then sometimes find themselves pedaling home after the sun’s gone down. This is dangerous because you’re almost invisible to drivers and you can’t see hazards that could cause a crash. It’s also illegal and you could be ticketed should a cop spot you. To avoid these risks we recommend coming in and picking up a basic lighting system comprised of a headlight and taillight. This will set you back only about $30 to $75 (depending on what you select) and offer you the peace of mind of knowing you’ll be safe no matter how late you ride. 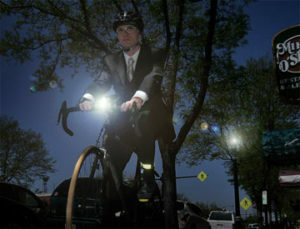 Plus, you’ll be prepared should you decide to commute to work when it’s dark, or just want to enjoy nighttime rides. You might wonder why you need a light when your bike is already equipped with reflectors. While these are helpful at night, they only light up when lit by a vehicle’s headlights. And, they do not light the road at all to help you see. So, for optimum safety, you really need lights. It’s also good to dress in bright and light colors for night rides. There are now also jackets and vests made of, or featuring, built-in reflective materials that makes you light up in traffic like a reflective street sign. Headlights attache to the handlebars with a small quick-release mount that makes removal easy when the light’s not needed. This means the light can also double as a handy flashlight for lighting the walkway to your front door; finding your keys; fixing flat tires; etc. Plus, it makes it easy to move the light to other bikes. Keep in mind that all of these lights meet the basic safety requirements for riding at night, yet they’re best for roads peripherally lit by traffic, buildings and streetlights. If you get into serious night riding where you travel long distances on unlit roads, or especially on trails, you should come in and look at our more advanced lighting options. Another type of basic light is the generator system. Generator lights increase visibility in traffic for safety, provide adequate light for navigation on roads, and don’t require batteries, which is their primary selling point. They cost more than basic battery lights since they are more complicated. These systems, however, aren’t as available or popular as they once were for 3 reasons: 1) They usually drag on the wheel (sometimes slipping and cutting out in wet weather). Note that there are also magnet-based generator lights that don’t cause drag. 2) They must be bolted to the bike (making them difficult to remove quickly for rides when you don’t need lighting). And, 3) They usually turn off when you’re not riding, which means at intersections you disappear to motorists unless you also carry a battery-powered bike light. If you’re riding at night, come in and see our wide selection of lights and let us light up your bike!